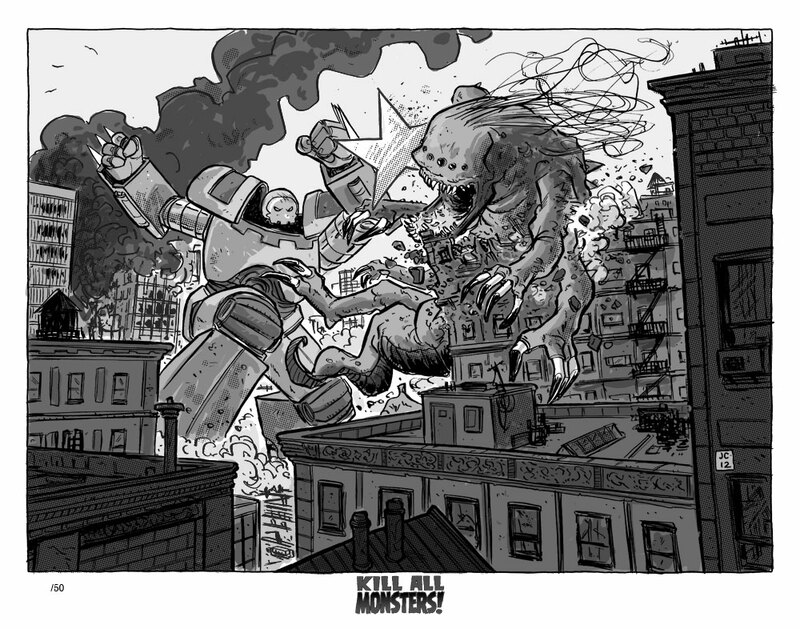 Limited edition Kill All Monsters prints debut at Image Expo | Kill All Monsters! This weekend is the Image Expo and Jason will be there with these nifty, extremely limited edition Kill All Monsters prints. There will also be a color version (I’ll show you that tomorrow), but this is not just a black-and-white print of a color file. Jason personally toned and gray-scaled these, so there are quite a few differences between the two versions. In addition to matching Jason’s black-and-white work on the actual comic, these are cool because he’s only printing 50 of them. If you’ll be at the Expo, you can find Jason at the New Reliable Press table (#306), which is also the home of Kill All Monsters‘ awesome letterer, Ed Brisson. This entry was posted in Giant Art, Giant Monsters, Giant Robots, Giant Things to Buy, KAM! News and tagged appearances, conventions on February 21, 2012 by Michael May.